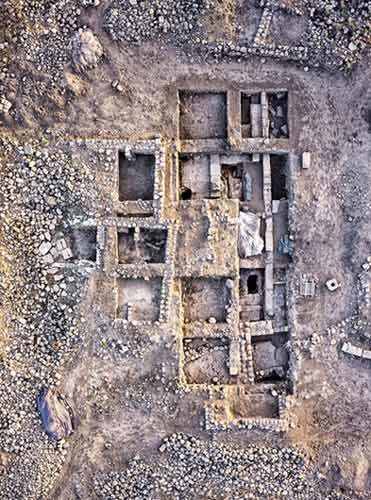 During the month of June 2014, a fourth season of excavations was conducted at Horbat Huqoq in eastern Galilee (License No. G-16/2014; map ref. 245198/754556; Magness 2012; Magness et al. 2013; Magness et al. 2014). 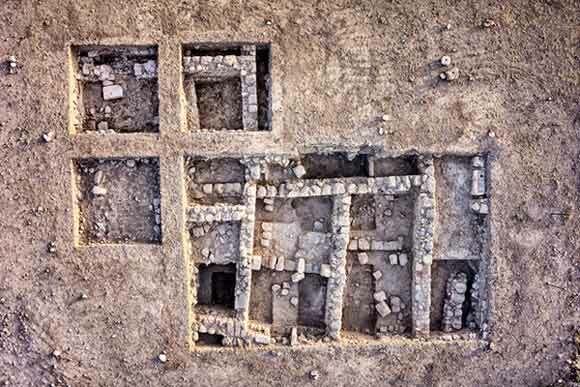 The excavations were undertaken and underwritten by the University of North Carolina at Chapel Hill, Brigham Young University (Utah), Trinity University (Texas) and the University of Toronto (Canada). Additional funding was provided by Dumbarton Oaks (Washington, D.C.), The Foundation for Biblical Archaeology (S. Bishop) and private donors. The excavation was directed by J. Magness, with the assistance of S. Kisilevitz (assistant director), M. Golan (administration), C. Spigel, M. Grey, and B. Gordon (area supervision), T. De’adle (consultant on the modern village), B. Coussens (assistant area supervisor), J. Bucko (surveying), J. Haberman (field photography), M. Robinson-Mohr (registration), D. Schindler (ceramics), K. Britt (mosaics), M. Belmaker (rodent remains), J. George (paleobotany), C. Swan (glass), N. Elkins (numismatics), P. Flesher (computer data and educational program), R. Mohr (drawing), V. Pirsky (drafting), O. Cohen (site conservation) and M. Lavie (cleaning and conservation of artifacts). Most of the volunteers were undergraduate and graduate students from the U.S.A. and Canada. This season’s excavations continued in two areas: Area 2000 (southeast [SE] quadrant), where remains of the ancient village were unearthed; and Area 3000 (southwest [SW] quadrant), where the synagogue and the remains of the modern village were uncovered. Three new squares (SE 6/5, 5/5, 5/6; Figs. 1, 2) were opened adjacent to the northwest corner of one or two domestic structures comprising eight rooms (1–8) that had been excavated in previous years; no floors or walls were reached in the southernmost square (SE 6/5), which was excavated for only a short time. In addition, excavations resumed in the western half of Room 2. The excavations revealed remains from four main periods: Late Roman–Byzantine (fifth–sixth/seventh centuries CE); Early Islamic (eighth–tenth centuries CE); medieval (eleventh–twelfth centuries CE); and Mamluk (thirteenth–fifteenth centuries CE). The remains will be described chronologically, from the earliest period to the latest. The Late Roman–Byzantine Periods. In Sqs SE 5/5 and 5/6 parts of two rooms (unnumbered) that form the northern extension of the Rooms 1–8 were excavated. The eastern room is delineated by W236, W239, W230, and possibly W225. Three successive floors were excavated in this room: a packed earth floor (L2189 at 27.08 m asl; henceforth all elevations are m asl), and two plaster floors (L2191 at 26.97; L2181 at 27.49). 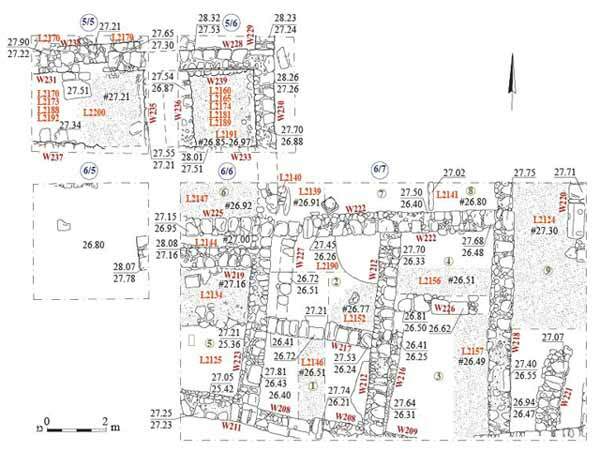 The western room, which was only partially uncovered, is delineated by W231 in the north and probably by W236, which is partly hidden in the eastern balk; the southern and western walls lie beyond the excavated area. A floor comprising patches of plaster (L2192 at 27.16–27.30) was found in the room, which in the eastern part of the room comes up to the foot of W231. Beneath this floor was a possible surface (L2200 at 27.21) which may be associated with a wall that runs beneath W231 (W238); the surface was left unexcavated at the end of the season, and its date is unknown. 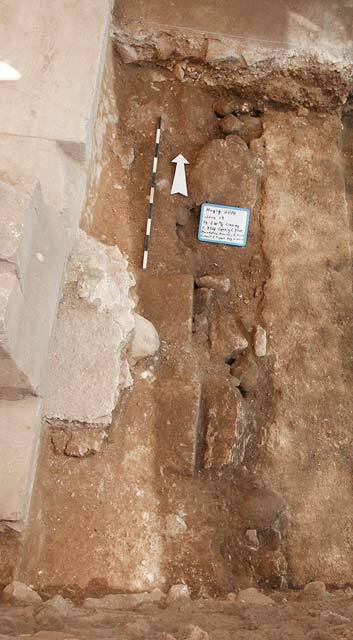 The renewed, limited excavations in Room 2 (Sqs SE 6/6 and 6/7) sought to clarify whether a north–south wall (W227) antedated the floor in this room or was part of an installation set on the floor. The results indicate that W227 consisted of only one course of stones and sat on top of a white plaster floor from the Late Roman–Byzantine periods (L2190 at 26.51–26.41). Locus 2142, identified in 2013 as a floor (Magness et al. 2014) is now understood to be an accumulation or fill above Floor 2190. The Early Islamic Period. During this period, a new structure was built with a similar orientation above the Late Roman–Byzantine building; two of the structure’s rooms were exposed (henceforth, the eastern and western rooms). The rooms included new walls—W235; W233 and its western continuation, W237; and W228, which was built above W239—and the reuse of a few earlier walls, such as W231, enclosing the western rooms on the north, and W230, on the east. The western wall of the western room lies beyond the excavated area. A packed-earth surface dating from the Early Islamic or the medieval period (L2174 at 27.53–27.61) was found in the eastern room, whereas in the western room two successive floors were exposed: a thick plaster floor (L2188 at 27.25–27.39) and a surface made of paving stones and packed yellow earth (L2170 and L2173 at c. 27.90). The surface was pitted by three robbers’ trenches, which apparently were dug to remove the paving stones and the stones from W231; the wall’s central part appears to have been robbed out. The Medieval Period. Remains of this period were discerned only in Sq SE 5/6, where the structure from the Early Islamic period continued in use, and the eastern room was repaved with a plaster floor (L2165 at 27.63–27.77), the make-up of which yielded pottery dating up to the eleventh century CE. The Mamluk Period. No floors attributed to this phase were found this season. Mamluk pottery discovered in medieval accumulations on Floor 2165 comes from Mamluk-period robbers’ trenches in both rooms. 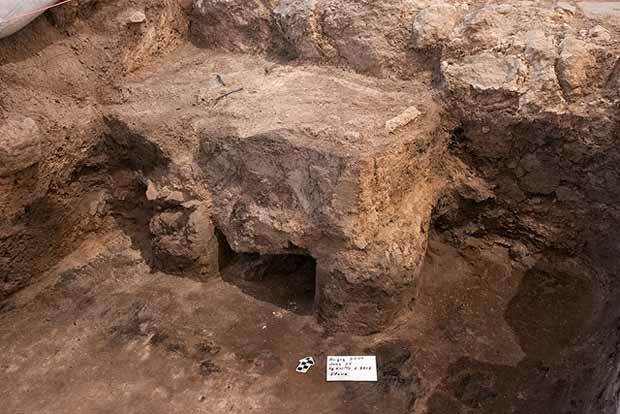 Work continued above and inside the synagogue, as digging resumed in previously excavated squares and new squares were opened in the center and northern part of Area 3000 (Fig. 3). The stratigraphic sequence previously discerned was supported by this season’s finds, and includes six main periods: Persian–Hellenistic (fifth–first centuries BCE); Late Roman (fifth century CE), characterized by the monumental synagogue; medieval (twelfth–thirteenth centuries CE), characterized by a monumental public building that reused the Late Roman synagogue; Mamluk (thirteenth–fifteenth centuries CE), characterized by accumulations/fills; Ottoman (primarily nineteenth – early twentieth centuries CE), characterized by tabuns and installations; and Late Ottoman to Modern (first half of the twentieth century), characterized by domestic buildings belonging to the village of Yakuk. The finds will be presented chronologically, from the earliest to the latest. The Persian–Hellenistic Periods. 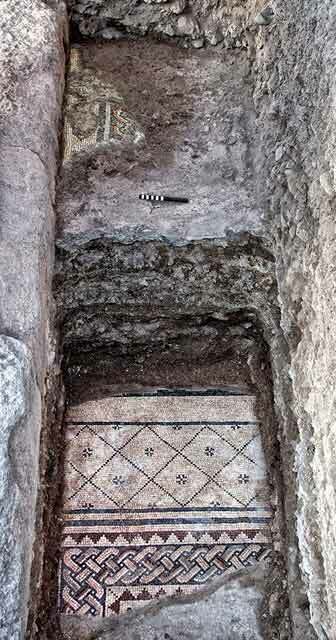 Fills containing large quantities of Persian and Hellenistic pottery, including an intact fusiform unguentarium, were excavated in a small sounding (1.75 × 1.75 m) under the mosaic floor in the southeastern corner of the Late Roman synagogue (see below). Excavations in the sounding were stopped well below the level of the synagogue’s east wall, yielding no architectural remains of the Hellenistic period (Fig. 4). The Late Roman Period – The Synagogue. Limited sections of the mosaic floor were exposed along the east aisle of the building, in the northeastern part of the area. These include a section of a mosaic with geometric designs (Fig. 5), and the northern part of an elaborate scene facing east containing three registers. The latter is the continuation of a panel that was discovered in 2013; it is cut in its upper, western edge by the foundation trench of the medieval building’s east stylobate. The lower register shows a wounded bull and soldier, and the middle register comprises a series of male figures framed by arches. The upper register, fully exposed during this season, revealed a scene that depicts an encounter between two large male figures, whose size and placement signify their importance. The right-hand figure (Fig. 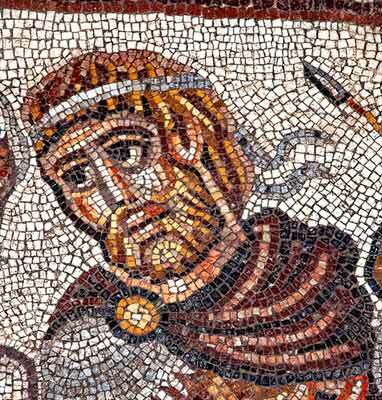 6) is clearly intended to represent a royal military commander and ruler: he is bearded, has a corded diadem on his head, is outfitted in an ornate battle dress and wears a purple cloak. This figure leads a large bull by the horns, and he is accompanied by a row of soldiers arranged as a Greek phalanx and by battle elephants with decorated collars and shields tied to their sides (Fig. 7). The commander/ruler is nodding to a bearded, elderly man who wears a ceremonial white tunic and mantle adorned with a gammadion. The elderly man is pointing upwards with his right index finger, and holds an unidentified object in his left hand. This figure is escorted by young men dressed in ceremonial white tunics and mantles with gammata, who are holding fully or partially sheathed swords in their left hands and are pointing upwards with their right index fingers. The elderly man and the white-robed young men accompanying him are the same figures as those depicted in the middle register. The increasing size and detail of the registers suggest that this is a narrative scene that was intended to be read from the bottom up. This mosaic panel continues into the south balk. The mosaic carpet is not preserved beyond a wavy ribbon pattern on the north side. In addition, the sounding (see Fig. 4) made under the mosaic, following its removal at the end of the 2013 season for conservation, revealed that it was laid over a layer of cobblestones mixed with crushed pottery and plaster; the plaster continued below the cobblestones. The latest pottery from the bedding of the mosaic floor ranges in date from the second century to mid-fourth century CE. No evidence of an earlier synagogue floor was found in the sounding. Instead, below the bedding were layers of earth fill. The latest pottery from these fills is a rim of a Kefar Hananya Form 1E bowl, which dates from the mid-third to late fourth – early fifth centuries CE. The Medieval Period – Monumental Public Building. This period is characterized by a large monumental public building constructed above the Late Roman synagogue. The later building reused the synagogue’s east wall and was lined by a bench made of reused ashlar blocks from the synagogue. A fill (thickness 0.4–0.5 m) consisting of deliberately dumped layers of yellow and brown soil and building chips was deposited over the ceiling collapse that lay above the mosaic floor of the Late Roman synagogue. The east aisle of the medieval building was paved with a mosaics, which are preserved only in small patches. The mosaic floor was laid over a thick, hard cobble and plaster bedding, c. 0.7 m above the synagogue’s mosaic floor (see Fig. 5). The meticulously hewn stones of the synagogue’s east stylobate were elevated to form the east aisle of this later building; a large pedestal (0.78 × 0.78 m, preserved to a height of 0.62 m), damaged at the top, rests on the stylobate. The eastern side of the stylobate is plastered, with a small patch of white mosaic preserved on top of the cobble and plaster bedding abutting it. A yellow glazed sherd found in the make-up of the cobble floor confirms the medieval date of the later floor and building. The stylobate’s foundation trench cut through accumulations overlying the Late Roman synagogue’s mosaic floor, beginning with a white-yellowish plaster layer that might represent the collapsed ceiling (Fig. 8). 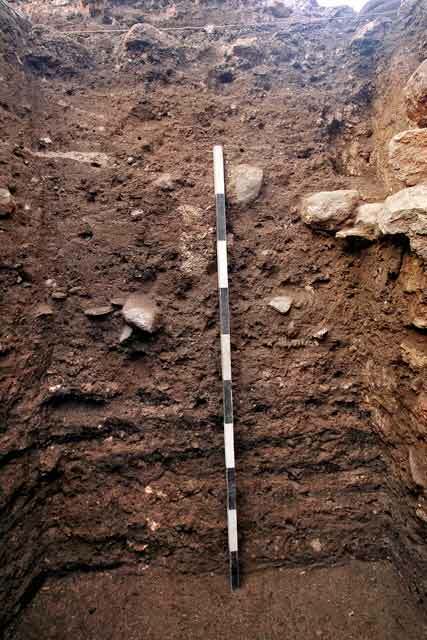 The foundation trench was filled with brown soil containing Late Roman–Byzantine pottery, and was covered by leveling fill under the medieval floor. 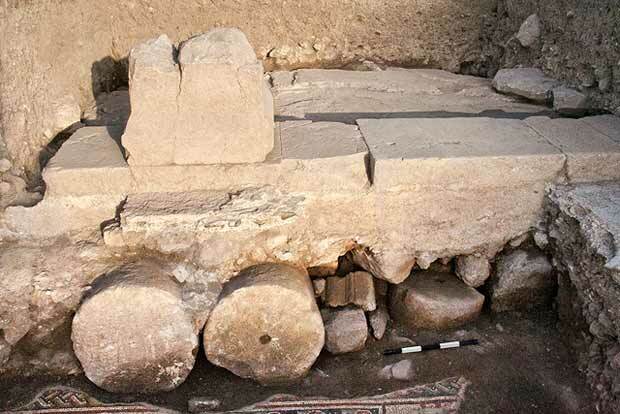 The ashlar blocks of the stylobate are supported on reused architectural elements from the earlier synagogue, including column drums (two of which are placed under the pedestal) and molded fragments (Fig. 9). The trench cut through the mosaic floor of the synagogue’s east aisle, but no remains of an earlier stylobate are visible below. It therefore appears that the stylobate originally belonged to the Late Roman synagogue, and was lifted c. 1 m to be reused in the later, medieval building. Two stone lined pits (silos?) of unknown date that appear to have been cut into the floor of the medieval building were found in the east aisle. The Mamluk Period. This period is characterized in this area by massive accumulations/fills that covered the medieval building, possibly signifying a period of abandonment. The Ottoman Period. During this period, most of the area functioned as an open space with a cistern and several built installations and tabuns; the latter are associated with massive amounts of ash. The tabuns, sometimes fenced off by meager walls, and the adjacent cistern suggest that this was a courtyard used for food preparation. Late Ottoman to Modern – Village of Yakuk. This stratum is characterized by a number of domestic structures: two large, adjoining buildings to the west, one in the southeast and part of a fourth building in the northeast. Each of the buildings consists of a single room, generally with pilasters that supported an arched ceiling, and with plaster floors and built installations, including a stove (Fig. 10). The finds from the structures included twentieth century coins as well as metal and glass objects. A north–south dirt path passes through the center of this area, separating the western structures and a stone wall that connected the structures to its east. This phase ended with a conflagration that burned the ceiling timbers and caused the walls and ceilings to collapse. Magness J. 2012. Huqoq – 2011. HA-ESI 124. Magness J., Kisilevitz S., Grey M., Spigel C. and Coussens B. 2013. Huqoq – 2012. HA-ESI 125. Magness J., Kisilevitz S., Grey M., Spigel C., Coussens B. and Britt K. 2014. Huqoq – 2013. HA-ESI 126. 1. Area 2000, aerial view, north at top. 3. Area 3000, aerial view, north at top. 4. Area 3000, sounding under mosaic floor, looking north. 5. Area 3000, the east aisle: the Late Roman mosaic (below) and a patch of medieval mosaic (above), looking south. 6. Area 3000, head of the royal military figure in the Late Roman mosaic, looking west. 7. 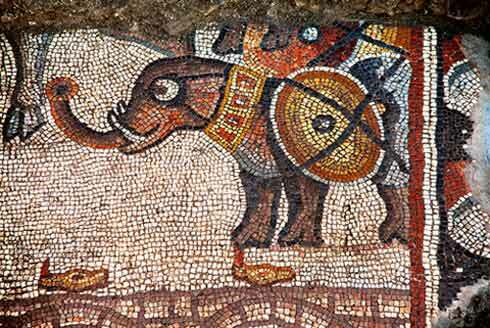 Area 3000, a battle elephant in the Late Roman mosaic, looking west. 8. Area 3000, synagogue ceiling collapse cut by the foundation trench of the medieval stylobate, looking north. 9. Area 3000, the stylobate and pedestal of the medieval building, looking west. 10. Area 3000, stove in twentieth century house, looking northwest.